KITTERY, Maine (NEWS CENTER) -- The Kittery Dispatch Center is getting a series of new upgrades which will help save lives. New technology will improve signal quality and strength for dispatchers and the public who calls them. Kittery Fire Chief David O'Brien said Monday that the current technology is more than 25 years old, and that the new technology is state-of-the-art. It is the first time Motorola will install this equipment in Maine. After the renovation, the center will also have a third bay station and console, which will make room to hire a third dispatcher to handle 911 calls. "It's an adrenaline rush. What's it going to be? Who's it going to be? And you don't know if it's an emergency call or a routine call," said Linda Driscoll, a dispatcher of 30 years in York County. KITTERY, Maine (NEWS CENTER) -- The 350 cyclists who participated in BikeMaine this year got a nice warm welcome back in Kittery.They finished the ride in Fort Foster Park where it all started a week ago. The cyclists rode about 350 miles over the past seven days. That's about 55 miles per day. Along the way, the riders visited Kittery, Old Orchard Beach, Bridgton, Bethel, Sweden and Kennebunk. "We had the best weather, except for rain the first day, but even that was something that I'm glad I had to experience," Mike Dunn said. "It was wonderful. I'm so glad I did it." Ross Healy, who lives on the West Coast, said he enjoyed his first trip to Maine. "It was one of the best ways to come, check out the state, see a lot of cool stuff, a lot of local culture, and the ride was just beautiful," he said. KITTERY, Maine (NEWS CENTER) -- Kittery Police is looking to speak to two people regarding an incident at Old Navy Friday. 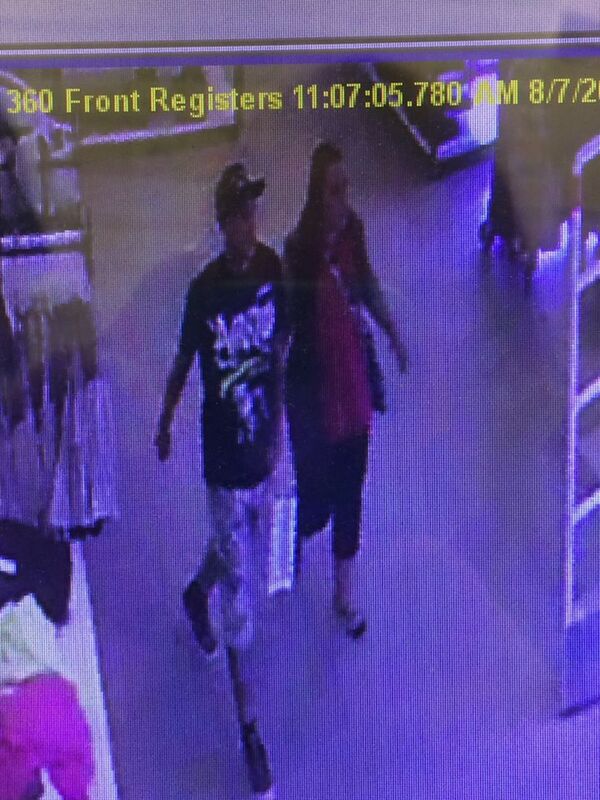 Police ask that anybody who can identify the two people in the photos from the Old Navy Outlets on U.S. Route 1 contact the department. KITTERY, Maine (NEWS CENTER) -- The Kittery Police Department has arrested a suspect in connection with a home burglary. Kittery police say a homeowner on Blueberry Lane came home to find that their residence had been broken into on Thursday. Several items had been taking including a Macbook, wedding ring and a necklace, police say. The value of these items was well over $2000.00. KITTERY, Maine (NEWS CENTER) - Kittery police have charged a man with several crimes after responding to a domestic violence assault report Friday night. The Kittery Police Department says Byron Buzzell, 40-years-old of Eliot, has been charged with Aggravated Assault (Class B Felony), Domestic Violence Criminal Threatening, Obstructing Report of a Crime, and Domestic Violence Assault (Class D Misdemeanors) after Friday's incident. Officials said when they arrived at the Wyman Street home, they found a 55-year-old woman who had allegedly been assaulted and strangled to the point of unconsciousness. Police said Buzzell was named as a suspect in the assault. Buzzell was not located after an initial canine search of the area. Kittery police did find Buzzell at approximately 5:30 a.m. on Goodwin Road in Eliot. WELLS, Maine (NEWS CENTER) - The Wells Police Department is asking residents to secure items after numerous bear sightings Friday night. Wells officials say several people have reported sightings of a bear in the area of Wire Road at Natanis Ridge. Officials say photo captured Friday evening (above) shows the bear eating from a bird feeder. Police recommend residents take down bird feeders and secure all trash in a garbage can or shed. YORK, Maine (NEWS CENTER) - Several York County communities responded to a Saturday morning two-alarm fire that sent one man to the hospital. York Beach Fire Chief Dave Bridges said when crews arrived at the Libby Lane home; flames were showing 15 to 20 feet high on the roof. Bridges said that firefighters were able to contain the flames to the left side of the duplex and that the fire was knocked down within 20 minutes. Officials said a man home at the time of the fire. Chief Bridges said the man saw his television on fire, his attempt to extinguish the flames was unsuccessful. The man was transported to the hospital with minor smoke inhalation injuries. Manpower was a huge help in this fire according to Chief Bridges. Bridges said if this fire had occurred during the week, the resulting damage could have been much worse. KITTERY, Maine (NEWS CENTER) - The Kittery Police Department says they have received several reports of mail and packages being removed from mailboxes in their town. Officials posted the warning on the town's Facebook page saying reports had been coming in that boxes on Dennett/Martin Road as well as Love Lane showed signs of tampering. Kittery police suggested people living in those areas be very aware of the packages and mail they receive. Police ask that residents check their receipts and bank statements to confirm they have received what they expected to receive. Give Us a Call, We Do It All!